SAN JOSE, Calif. – April 4, 2017 – Online retailing continues to prove its resilience with strong growth and a positive forecast for 2017. A new e-commerce report published by SLI Systems (SLI.NZ), a global leader and provider of e-commerce solutions and services, found 94% of retail professionals surveyed expected to expand their businesses during Q1. When respondents were asked about expected results in Q1 2017 compared to the same quarter last year, the vast majority cited performance improvements across an array of factors, including online revenue, site conversion, mobile transactions and site traffic. 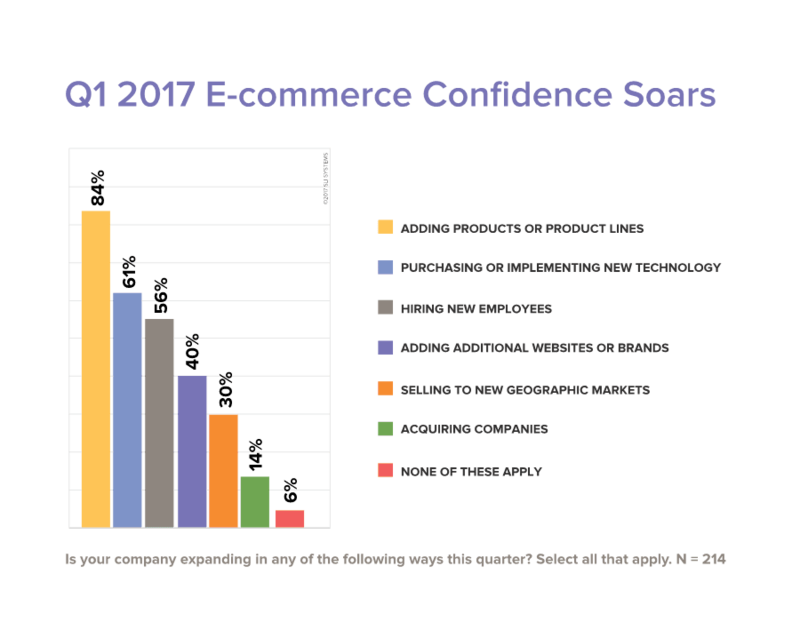 Respondents to the Q1 2017 E-commerce Performance Indicators and Confidence (EPIC) Report represent a mix of retail business models, including pure e-commerce, as well as omnichannel merchants. In addition, 87% of respondents work in a manager position or above and 20% hold VP- or C-level positions. The full report is available for download for no cost at http://sitesearch.sli-systems.com/Epic-Report.html. The EPIC Report includes a detailed Respondent Overview, Confidence and Performance Indicators, Top of Mind (anticipated business impact of the new U.S. presidential administration) and Search Trend Analysis, benchmarking the average number of words in a site search query. Widespread Confidence – When asked about six areas of planned expansion in Q1, from product expansion to hiring, 94% of respondents selected at least one area of growth. Q1 Revenues & Profits – 80% of respondents expect an increase in online revenues and profits, and 46% expect an increase in their in-store revenues and profits. Amazon – 32% of U.S. respondents, 38% of those in the UK, and 47% in Australia report Amazon is more of a competitive threat compared to the same quarter last year. Trump – U.S. retailers (generally) anticipate the new U.S. Administration will have a positive impact on corporate taxes, a negative impact on selling internationally, and no impact on online sales taxes. 23% of UK respondents expect the administration will have a somewhat or very negative impact, versus 6% citing a somewhat or very positive impact on their online businesses. CHART: The Q1 2017 EPIC Report found widespread confidence among online retailers with 94% of respondents selecting at least one area of planned growth during the first quarter of 2017. Eighty-seven percent of participants work in a manager position or above and 20% hold executive-level positions. Q1 2017 EPIC Report results are from an electronic survey conducted between February 6 – March 6, 2017. SLI received qualified (non-vendor or consultant) responses from more than 200 e-commerce professionals worldwide headquartered primarily in the U.S., UK, Australia and New Zealand. All respondents sell goods or services online, with 59% selling in stores, 36% via catalogs and call centers, and 42% on at least one marketplace. SLI Systems (SLI.NZ) accelerates e-commerce for the world’s top retailers by generating more traffic, converting shoppers into buyers and maximizing order values through solutions that improve site search, navigation, mobile, merchandising, personalization, recommendations and SEO. SLI is the most chosen SaaS-based site search provider to Internet Retailer Top 1,000 retailers. The SLI Buyer Engine combines user behavior and machine learning to accurately predict what shoppers are most likely to buy, shortening the path to purchase. The SLI Commerce Console™ organizes key sales insight and tuning capabilities into one easy-to-use cloud-based console. SLI Systems operates on five continents and offers solutions in 20 languages. For more information, visit www.sli-systems.com or connect with us on Twitter @slisystems.